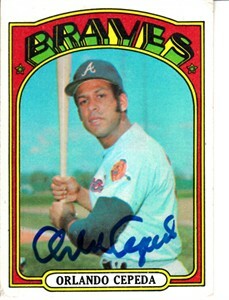 1972 Topps baseball card autographed in blue marker by Hall of Famer Orlando Cepeda. About VG condition. Witnessed and authenticated by MLB with their numbered hologram on the back. With certificate of authenticity from AutographsForSale.com. ONLY ONE OF THIS CARD AVAILABLE FOR SALE.